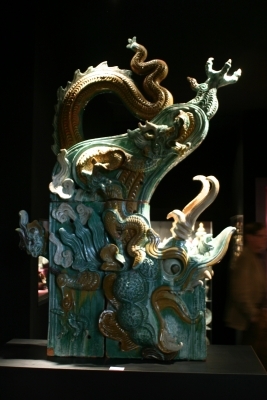 Two roof ornaments in the shape of dragons, one facing left and the other facing right. Their body are resting on a rectangular pedestal of roof finial. The finials are decorated with a floral pattern. The dragons have a twisted body, which is covered with finely detailed scales. Their heads have bulging eyes and a snarling mouth. They wear a fierce expression on their faces. The two dragons are glazed in ochre, orange and turquoise. In Chinese folk religion the roof ornament is believed to guard the house. One of the most commonly used shapes for these roof ornaments is undoubtedly the dragon. The dragon was seen as the symbol of power and strength, and therefore it was the appropriate animal to guard home and family. 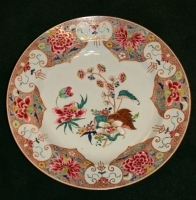 Six Imari plates, large size, all intact, no restorations.